Owning a pet? That means you are the most blessed person ever. Because, pet’s synonyms are love, care, compassion, and loyalty! Most of us know that we can have a wonderful experience being a pet owner because of all the services they provide us. But sometimes, they behave crankily, and we feel excessive and unwanted barking for no reason at all. When we try to make them stop from barking, they bark even louder and may put us in some embarrassing situations. Then, we start finding various options to prevent our dogs from barking for our and our neighbours’ or guests’ peace of mind. One of the most effective and widely accepted options is – the anti bark collar. 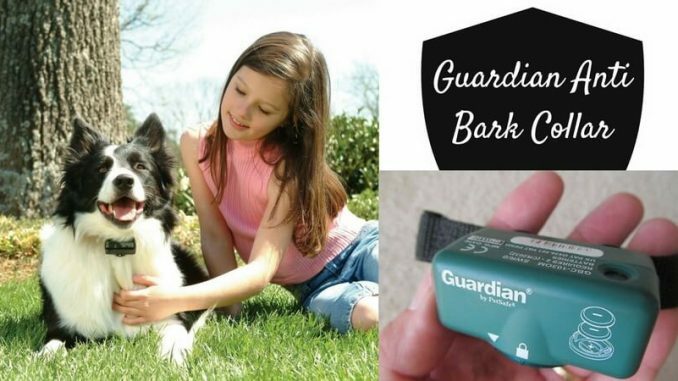 In this article, I am going to review guardian by pet safe anti-bark collar, one of the leading brands of the anti bark collars. So, let’s go for a ride where I explain the features, specifications, pros, and cons of the product. If you have a pet, especially a pet weighting of 8 lbs or more, then this collar may become the perfect choice for him. The collar works by the operation of static levels connected with the contact points which can be activated by the vibration of your dog’s bark. The anti bark collar is the kind of a product which encourages the dog or any other pet to stop barking. We being an owner have to attach it to the dog, just like any other collar and that’s it! When they bark, it gives a light amount of shock which the dog does not like at all, and thus they stop barking. It has the facility of microprocessor technology which can distinguish between the barking and the other irrelevant noises and vibrations. This anti bark collar is waterproof. So, if you have a playful or notorious dog breed, then also there is no risk of the damage to the machine due to water. It adjusts automatically with the dog’s temperaments. There are six levels and the corrections increase with each bark. It becomes stronger and stronger. It includes sound and vibration sensitivity which makes it the best anti bark electric stimulation collar of PetSafe. It is also lightweight so that the dogs do not feel uncomfortable. The kit includes CR2032 batteries and a guide of operating instructions. The collar comes with the nylon straps which are easily adjustable. As I said, it has six level of corrections which means the machine provides six levels of intensities. When the dog barks for the first time, Guardian anti bark collar tingles softly just to give a sign to the pooch. But when he continues to bark, then it gets stronger and stronger until its safety feature allows the machine. As mentioned above, the collar gives minor shocks to the dog so that he stops barking. But here, many pet owners get curious regarding the shock training like what if the dog will not stop barking? They are worried about their beloved furry friend. But, let me tell you one thing that luckily the guardian anti bark collar can stop that problem. There is no need of worrying at all. It has a built-in safety feature. So, when your dog barks more than 15 times in a 50 second period, the collar will shut off for three minutes, and after this interval, it will be reactivated automatically. First of all, allow your pet to wear the collar for few minutes. After some time passed, recheck the fit as your pet becomes more comfortable wearing the anti bark collar. The contact probes must be in the direct contact with the pet’s skin and directly under his neck. If your dog has the heavy coat, it is preferable to trim the fur around the neck so that the contact probes can touch the neck to feel vibrations. Apart from all these points, also make sure that the contact of the machine keeps the consistent connections with the dog. There is a red light which blinks each time when the dog gets the shock. So yes, that’s all for the Guardian anti bark collar reviews. The most important thing is that the collar should fit properly still must be loose enough so that it can allow one of your fingers to fit between the contact point and the dog’s neck. The proper fit and placement of the collar are critical to effective training. Everything else is just fine with the product. We can also cut the excess strap from it if it is too long. Isn’t this collar is as great as the leather ones? So don’t have any doubts in mind and order it today!